At two-for-one price this double gives you the chance to delve into comparatively rare chamber music territory. Virgin and the Kandinsky Quartet have stepped outside the common French repertoire. Although the discs are hardly packed to capacity they are nevertheless a passport into what for many will be an undiscovered country. All the composers on show here, save Saint-Saëns, were pupils of Franck. 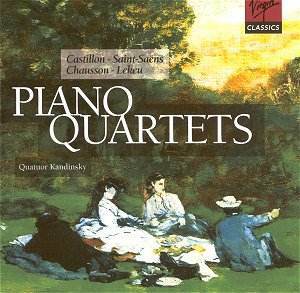 All of these French nineteenth century piano quartets are in four movements apart from the incomplete Lekeu. The de Castillon, which was dedicated to Anton Rubinstein, has a tortured Beethovenian passion and a loveably romantic Larghetto. His Piano Concerto was premiered by Saint-Saëns in 1872 at a Pasdeloup concert. It was hissed by the audience who objected to such serious music. You can hear it still if you can track down EMI Classics CDM 7 63943 2 - part of EMI�s valuable �L�Esprit Française� series. There the concerto is played by Aldo Ciccolini and the orchestra is the Orchestre Philharmonique de Monte-Carlo conducted by Georges Prêtre. The coupling is de Castillon�s other major orchestral work. Esquisses Symphoniques. At some stage it would be interesting to hear his two string quartets, two piano trios and violin sonata. Saint-Saëns was a prodigal writer. Not surprisingly, his 1875 Piano Quartet is a brilliant piece with ideas tumbling out in profusion. While Mendelssohn is undoubtedly a presence in this music so too is Beethoven; just as much as in the French composer�s famous Second Piano Concerto. As for Mendelssohn, the work most often recalled is the Capriccio Brillant although the fleet-footed fairies of A Midsummer Night�s Dream caper through the pages of the poco allegro. At 6.30 in the finale, Saint-Saëns achieves a magically hushed effect with the return of the main theme - a coup worthy of Fauré. The Chausson is the longest work here. It is also the latest. Its rounded melodic contours and lofty fervour relate it to the piano quartets of Fauré�s; especially the First. The dark urgency apparent in the finale relates back to the music of César Franck. If the ideas are not as resilient and fresh as those of his two models this music has great atmosphere. Two movements (here presented in a single track) are all that was written of the Lekeu Piano Quartet in B minor. This too has warm and rushing melos of sound added to which Lekeu brings a triumphant joy disporting in a sunny Gallic radiance; playful and passionate. The notes are very short for such unfamiliar music. However if you fancy a sultry ambience (largely indistinguishable between the two venues) and a surgingly romantic and warm-blooded approach to four nineteenth century French piano quartets you need look no further.